Mackie announces their new ProDX Series, an all-new line of ultra-compact digital mixers with complete wireless control, are now shipping worldwide. Ideal for solo performers, small bands, venues and commercial applications that require lower channel counts, both mixers are equipped with Mackie’s Wide-Z™ mic preamps that can handle a mic or guitar with no gain adjustments. And with their single knob hardware design, any user can make quick and easy level adjustments. Using the companion MixerConnect™ control app, users unlock powerful processing and total wireless control plus the ability to wirelessly play music or backing tracks from any Bluetooth® capable device. Wireless control via MixerConnect allows ProDX mixers to be stored safely and out of sight without losing any control. Performers can attach their phone to a mic stand for fast changes to their mix without interrupting the performance to run to the mixer. Both models feature an integrated control bridge, offering a convenient place to set a phone or tablet at just the right angle for keeping an eye on the mix. 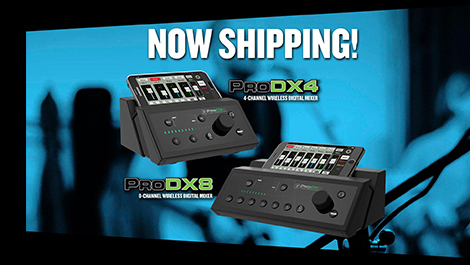 ProDX mixers provide the tools users need to dial in a great mix. An easy-to-use 3-band EQ with sweepable mid, low cut and no-hassle compression per channel delivers pro sound with zero fuss. Built-in ReadyFX™ offers a choice of 16 great-sounding effects, so users can pick the perfect delay for their guitar or apply reverb, adding life to any vocal application. A flexible graphic EQ on all outputs allows fine tuning of the overall mix. Plus, users can save their mix and instantly recall at the next show for quick setup. The companion MixerConnect app is available for free download and is a great way to check out the mixer before purchase.